Today’s the last day for 25% off with SHOES at Macy’s. I’ll be wearing a lot of loafers & booties this fall. Here are some super duper cute ones. I think my favorite is probably the Mizrahi Zarek. 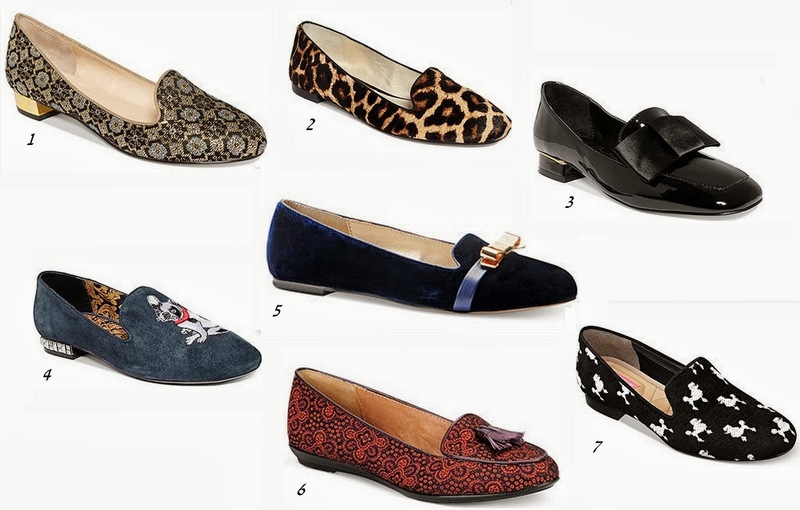 3 – Kelsi Dagger Suzara– A very literal tuxedo shoe for a woman. I think it’s very cute. 4 – Boutique 9 Yorocco – I’m not a fan of bulldogs in particular, but this is cute. 5 – Isola Nyla – I like the pert bow. The blue is beautiful. Comes in burgundy & black. 7 – Isaac Mizrahi Zarek – A poodle print! So Mizrahi. There’s also a tapestry pattern that’s like a Steve Madden loafer I missed out on. 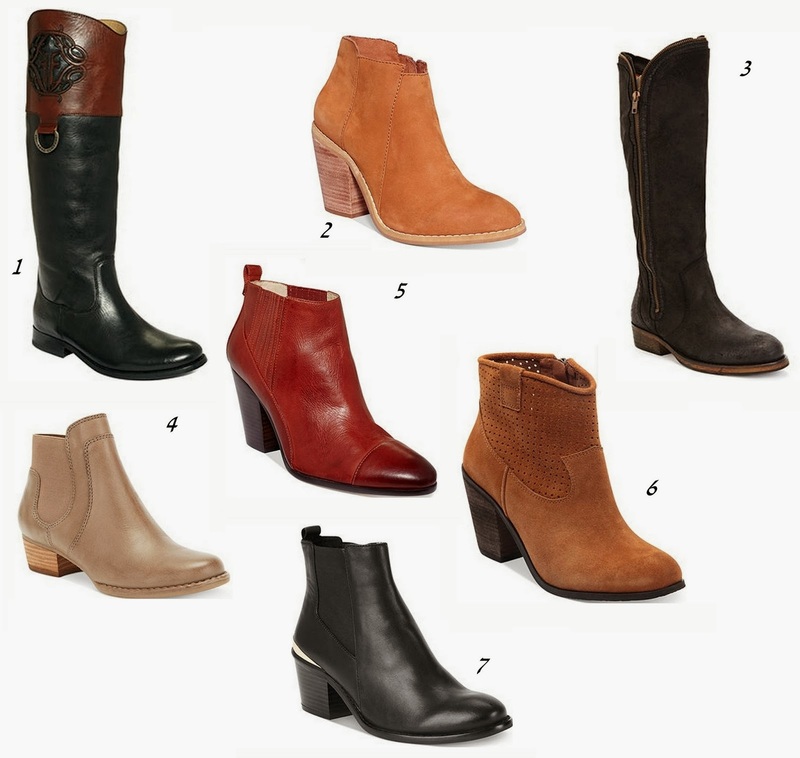 * Frye Melissa – SHOES worked on a mockcheck. * Kelsi Dagger Jaegger – I love heels that sit like this. No elongated or exaggerated foot length. * Bronx Try Umph – A rugged look. * Giani Bernini Euston – Love this neutral. * Joan & David Hudsen – This color! * Vince Camuto Holden – Comes in 4 colors. * INC Ricky Chelsea – The foot length looks a little long, but the swipe of gold brings the eye back to the heel. This code is incredibly temping, but I’m trying not to buy shoes until I go thru all of the ones I own. I hope I don’t regret passing up on the Giani Bernini Euston. Thanks for every other wonderful article. The place else could anyone get that type of information in such a perfect approach of writing? I have a presentation next week, and I am on the look for such information. I simply want to mention I’m beginner to weblog and definitely enjoyed this website. Probably I’m likely to bookmark your blog post . You absolutely come with wonderful posts. Many thanks for sharing with us your webpage. I just want to mention I am just all new to blogs and honestly savored you’re web blog. Likely I’m want to bookmark your site . You actually come with good well written articles. Thanks for sharing your web site. I just want to say I am just beginner to blogging and honestly liked you’re web-site. Probably I’m going to bookmark your website . You certainly come with exceptional stories. Kudos for sharing with us your web site. I just want to tell you that I am just new to weblog and actually savored you’re web-site. Almost certainly I’m want to bookmark your blog post . You amazingly have tremendous well written articles. Regards for sharing with us your website. I simply want to say I am newbie to blogs and certainly enjoyed you’re web blog. Very likely I’m likely to bookmark your blog . You amazingly have exceptional articles. Thanks a lot for revealing your web page. I simply want to mention I’m very new to blogs and certainly loved your blog site. More than likely I’m planning to bookmark your blog post . You definitely come with amazing articles and reviews. Thanks for revealing your blog. I simply want to tell you that I’m beginner to blogging and site-building and definitely savored you’re web-site. Probably I’m going to bookmark your website . You surely have excellent well written articles. Many thanks for sharing with us your blog site. I simply want to tell you that I’m newbie to weblog and seriously enjoyed your web blog. Almost certainly I’m going to bookmark your blog . You certainly have amazing writings. Thanks for revealing your blog site. I just want to mention I’m new to weblog and honestly liked your web-site. Almost certainly I’m going to bookmark your blog post . You absolutely come with good writings. Bless you for sharing your web page. I have to get across my love for your kind-heartedness for individuals that must have help on this particular area of interest. Your very own dedication to passing the solution all over has been incredibly good and have usually helped those just like me to achieve their objectives. The helpful guide signifies a great deal to me and even further to my office colleagues. With thanks; from each one of us. You could definitely see your expertise within the work you write. The arena hopes for even more passionate writers such as you who aren’t afraid to say how they believe. All the time go after your heart. I just want to say I am very new to blogs and absolutely savored your web site. Probably I’m likely to bookmark your site . You actually have superb articles. Thanks a lot for revealing your web page. I just want to mention I am beginner to blogs and certainly loved your web-site. Probably I’m want to bookmark your blog post . You definitely come with awesome article content. With thanks for sharing your webpage. If you lie down with dogs youll rise with fleas. I do not even know the way I ended up here, however I thought this put up was once great. I do not understand who you are but definitely you’re going to a well-known blogger if you happen to aren’t already 😉 Cheers! Wow, incredible weblog format! How long have you been blogging for? you made running a blog look easy. The whole glance of your web site is excellent, as smartly as the content! Thanks, I’ve just been looking for information approximately this topic for a while and yours is the greatest I’ve came upon till now. But, what about the bottom line? Are you certain in regards to the supply? I want to show appreciation to you just for rescuing me from this difficulty. After searching throughout the world wide web and meeting principles which are not powerful, I thought my life was gone. Being alive devoid of the answers to the difficulties you have fixed all through your entire short post is a serious case, and the kind that could have in a wrong way affected my career if I had not discovered the website. Your personal expertise and kindness in playing with every item was very useful. I’m not sure what I would have done if I had not discovered such a stuff like this. I can also at this time look forward to my future. Thanks for your time so much for your high quality and result oriented guide. I won’t hesitate to refer your web blog to anyone who needs to have assistance about this situation. Hello, Neat post. There is a problem along with your web site in web explorer, would check this¡K IE nonetheless is the market chief and a big component to other people will miss your fantastic writing due to this problem. I do agree with all of the ideas you’ve offered to your post. They are really convincing and will definitely work. Nonetheless, the posts are too quick for beginners. May you please extend them a little from next time? Thank you for the post. Whats Happening i am new to this, I stumbled upon this I’ve discovered It absolutely useful and it has helped me out loads. I hope to give a contribution & assist other customers like its helped me. Great job. Thank you a lot for giving everyone an extraordinarily breathtaking opportunity to read critical reviews from here. It’s always so amazing and full of amusement for me personally and my office mates to visit the blog minimum thrice weekly to find out the fresh items you have. Of course, I’m just usually pleased with the astounding ideas you give. Certain 3 tips in this article are definitely the simplest we have all had. Aw, this was a very nice post. Spending some time and actual effort to generate a really good article… but what can I say… I procrastinate a whole lot and don’t seem to get nearly anything done. Your style is unique in comparison to other people I have read stuff from. Thanks for posting when you’ve got the opportunity, Guess I’ll just bookmark this blog. Thanks , I have just been looking for information about this subject for a long time and yours is the best I’ve found out so far. But, what concerning the conclusion? Are you sure concerning the supply? Excellent goods from you, man. I have understand your stuff previous to and you are just too great. I actually like what you’ve acquired here, really like what you are saying and the way in which you say it. You make it enjoyable and you still take care of to keep it sensible. I can not wait to read much more from you. This is actually a great site. I love reading through an article that will make people think. Also, many thanks for allowing me to comment! of course like your website however you have to take a look at the spelling on quite a few of your posts. A number of them are rife with spelling issues and I to find it very bothersome to tell the truth however I will surely come back again. Very good written story. It will be valuable to everyone who employess it, as well as yours truly :). Keep doing what you are doing – looking forward to more posts. Excellent post. I was checking constantly this blog and I am impressed! Very helpful info specifically the last part 🙂 I care for such information a lot. I was looking for this certain info for a very long time. Thank you and best of luck. May I simply say what a comfort to discover someone who really knows what they are discussing over the internet. You certainly understand how to bring a problem to light and make it important. More and more people must check this out and understand this side of your story. I can’t believe you are not more popular since you certainly possess the gift. Hey there! I just would like to give you a big thumbs up for your excellent information you have got right here on this post. I am returning to your website for more soon. Aw, this was an exceptionally good post. Spending some time and actual effort to make a good article… but what can I say… I procrastinate a whole lot and don’t seem to get anything done. Having read this I thought it was extremely informative. I appreciate you spending some time and effort to put this content together. I once again find myself spending a significant amount of time both reading and leaving comments. But so what, it was still worthwhile! Good post. I learn something new and challenging on sites I stumbleupon on a daily basis. It’s always interesting to read content from other authors and use something from their web sites. An outstanding share! I’ve just forwarded this onto a coworker who was conducting a little homework on this. And he actually bought me breakfast due to the fact that I stumbled upon it for him… lol. So allow me to reword this…. Thanks for the meal!! But yeah, thanx for spending some time to talk about this matter here on your site. You need to take part in a contest for one of the most useful websites on the web. I will recommend this website! hello there and thank you for your information – I’ve certainly picked up something new from right here. I did however expertise a few technical issues using this site, as I experienced to reload the website many times previous to I could get it to load properly. I had been wondering if your hosting is OK? Not that I’m complaining, but sluggish loading instances times will sometimes affect your placement in google and can damage your quality score if ads and marketing with Adwords. Well I am adding this RSS to my e-mail and could look out for a lot more of your respective intriguing content. Make sure you update this again very soon..
I’m very happy to find this page. I need to to thank you for ones time for this particularly fantastic read!! I definitely savored every bit of it and i also have you saved as a favorite to look at new things in your website.